MADISON, Wis. — A study in the current journal Oncotarget provides the first evidence linking a disturbance of the most common protein in the body with a poor outcome in pancreatic cancer. The study reinforces growing evidence that collagen, which forms fibrous networks in skin, tendons and muscles, is intimately involved in several cancers, says the paper's corresponding author, Kevin Eliceiri, director of the Laboratory for Optical and Computational Instrumentation (LOCI) at the University of Wisconsin-Madison. For the study, the Wisconsin researchers examined surgical tissues from 114 pancreatic cancer patients and identified a particular rearrangement of collagen fibers surrounding the tumor as a "biomarker" of early death. A similar rearrangement of collagen has also been found in breast cancer, head, neck, esophageal and colorectal cancers. "Collagen is the most abundant protein in the body," says Eliceiri. "It's a beautiful molecule — wavy, with a fibrous nature. Without it we would be a sack of nothing. With this little molecule, the specific fiber organization really matters to metastasis." The images were created using an automated laser scanning microscope developed at LOCI that shines a laser at tumor specimens mounted on microscope slides. The laser's bright, rapid pulses interact with the collagen fibers, which glow and reveal exquisite details of their structure and relationship to nearby fibers. The new study tested how collagen formation might affect metastasis, Eliceiri says. "We did not know anything about survival when we measured the alignment of the collagen in tumors from 114 pancreatic cancer patients. When we looked at the clinical records, we found that the tumors with highly aligned collagen fibers had the worst survival. To our knowledge, this is the first time this technique was used for prognostic purposes in pancreatic cancer." First author Cole Drifka, a biomedical engineering postdoctoral researcher, conceived and performed the study under the supervision of Eliceiri and W. John Kao, a professor of pharmacy. "The powerful tissue resource used in this study was made possible by generous financial donations from Teresa's Foundation for Pancreatic Cancer and the Tim and Mary Ann McKenzie Chair of Surgical Oncology Professorship," says Drifka. "Above all, it was made possible by the selfless tissue donations by UW Health patients. The new tissue collection represents a blossoming institutional focus on pancreatic cancer and is now available to all campus researchers seeking to comprehend this challenging disease." Finding and fighting metastases is a focus in cancer treatment, Eliceiri explains. "The original tumor seldom kills; poor prognosis is usually due to metastases as they spread to new tissues and organs." The LOCI lab specializes in developing new imaging techniques for living things, with a special interest in studying cells in their microenvironment rather than in isolation. In the case of several major tumor types, the collagen matrix plays a critical role, Eliceiri says. For reasons yet to be determined, he adds, "cancer progression seems to be associated with the reorientation of the direction of the collagen. The tumor starts with collagen wrapped around it, but when it's time to metastasize, the collagen fiber changes it alignment." If alignment matters to metastasis, "We want to know what causes the alignment shift, because then maybe we could block that change," Eliceiri says. For example, if a signaling molecule initiates the realignment, it could be a target for drugs. Collagen, a structural protein often involved in scarring and wound healing, is emerging as an important factor in a number of other diseases, Eliceiri says. "Collagen may be harmful or protective, but in every disease where collagen is present, it's part of the disease process." 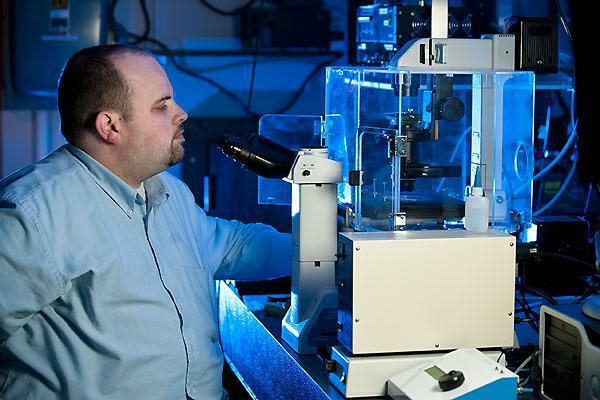 More than a dozen labs at UW-Madison are working on various aspects of collagen. For example, Patricia Keely, professor and chair of cell and regenerative biology who studies the matrix surrounding cells, is exploring its link to breast cancer. Paul Campagnola, a professor of biomedical engineering, is exploring its link in ovarian and lung cancer. Sharon Weber, a co-author on the Oncotarget paper and a professor of surgery, concentrates on pancreatic cancer. Understanding collagen's role in cancer could have several uses, Weber says. "Prognosis, which is our focus in this paper, is one. Can we identify some signature in the pattern of collagen that will help us understand which patients are going to do well and which are not? Might collagen patterns also help us sort out which patients should undergo surgery? The patterns of collagen in cancer might also be used to ascertain the effectiveness of chemotherapy or radiation so that we can utilize those toxic treatments in those patients who will benefit most." In cancer, Weber says, knowledge is power. "It would be amazing if we could use these differences in collagen patterns to help discover new therapeutic targets for this devastating disease."